items you see in the photo above perform like traditional binders, yet are environmentally friendly. Our "Enviro-Plus" binder covering is a non-acidic, aqueous-coated material on a 100% cotton base. Binders using this material is of 76% recycled material, completing the loop in the recycling process. We even use an organic hot glue on binders where glue is required. 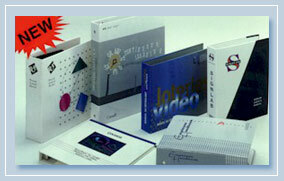 of 1 to 6 colour offset printing to customize your binder.